After I cook a whole chicken and pull off the meat as our homemade organic lunchmeat, I put everything else back in the pot that I cooked the chicken in. 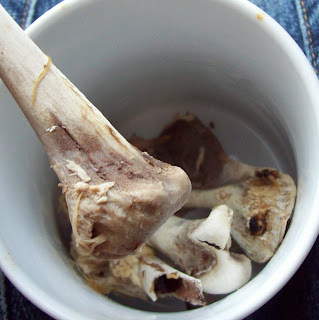 In goes the skin, bones, gristle, doesn't it look nice? Then I add a tablespoon or so of apple cider vinegar and fill the pot to within a couple inches of the top with filtered water. I used to do all this in the crockpot, but I bought a nice big 8 quart stockpot a while ago and have been boiling the chicken/cooking the stock in there since. I usually leave the water that I boiled the chicken in to use for the stock. 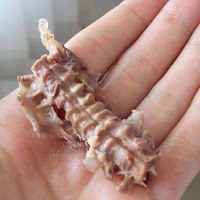 Chicken vertebrae (I think). I think it would be easier for children to learn lessons such as anatomy and physiology if they were exposed to such on a weekly basis, don't you? I bring the chicken parts/water/apple cider vinegar (I've been using Bragg's brand from the health food store) to the pot, I bring up to a boil, then lower down to a simmer and simmer uncovered for 12+ hours, usually overnight. Chicken stock is said to have many health benefits, including being full of calcium (I tried explaining this to the pediatrician a few months back... didn't go well. I sometimes forget that not everyone is as excited about real foods as I am) and other good things that are pulled out of the bones. 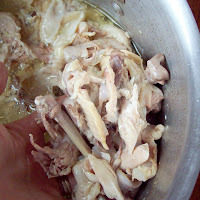 Above is a post-broth chicken bone. See how easy it crumbles when I pinch it? 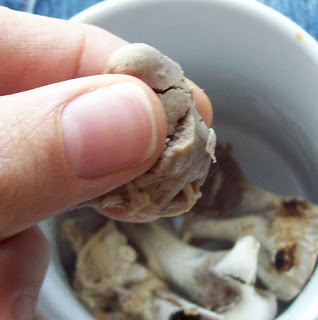 Calcium was taken out of the bone and put into the broth for us to drink and use in soups. If you're a pro at this and looking for something more, check out Nourished Kitchen's Chicken Feet Stock. I haven't gotten there yet, there's plenty of real food areas that I'm still working my way up to. And follow In Word Adorning's directions for adding herbs for immune boosting properties. What do you use chicken stock for? 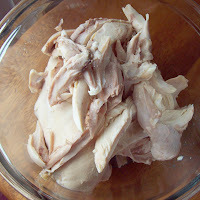 0 Response to "Making Nourishing Traditions Style Chicken Stock"